Zombies! Zombies everywhere! That was the theme this year at E3 2014 and, to be honest, it’s a theme that has been reused time and time again in our current gaming market. At this point, many of us are zombie sick, and that’s why more recent zombie games have been offering us zombies with a twist. 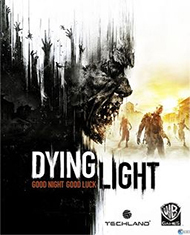 One of the latest to be announced is Dying Light, a game by polish developer Techland and published by Warner Bros. Entertainment. We got a chance to see this game in action at E3 2014 this year. What does Dying Light do to set itself apart from all other zombie games out there. First of all, the game has a unique setting. It is set in South American cities and slums, and the whole game is (buzzword) open world. Players will walk through alleyways, pass through lean-tos, and run along rooftops to avoid the zombie horde. As a result, there is a deep focus on parkour and terrain traversal in Dying Light, as how you get around will play a significant part in how you avoid zombie hordes. You’ll even get grappling hooks and zip lines to help you get around the map at high speeds. 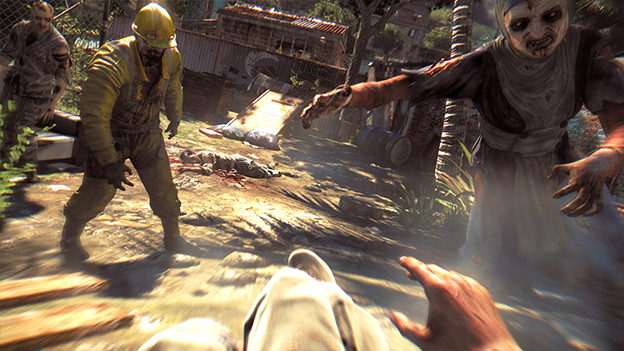 Dying Light isn’t a zombie game that makes you feel underpowered. Rather, it puts more of a focus on the action aspect of the zombie apocalypse. You have a huge arsenal of weapons to choose from, over 100 in the game. Most are melee weapons, but a lot of these weapons have interesting functionality. For example, one of these weapons is an electric baton that can stun people and one shot zombies. Heavy hammers can cause quakes that hurt zombies in an AOE. Certain weapons allow you to get up close and personal with zombies, punching and kicking them like an undead Steven Segal. On top of these weapons, there are numerous guns and even crafted weapons that you can take advantage of. With a little time you’ll be firing explosive bullets, swinging baseball bats that are on fire, blowing up cars and more. You’ll be able to forge knives with lighters on them, axes with tasers on them, speras with chainsaws on them--the forging system is just awesome. It’s a lot less about surviving the zombies and a lot more about choosing how you kill the zombies. Another big part of the game is the day/night cycle which is constantly active. Aside from only making certain missions available at night or during the day, the day/night cycle also effects zombie behavior. During the day, zombies are kind of the slow shamblers that you love to mow through. If you make noise, other zombies will come to join in the fray, but you still can probably make it out unscathed. At night, zombies become incredibly aggressive. An errant noise will summon feeding frenzies to your position, giving you little chance to survive. You’ll have to stick to the rooftops and take your shots from afar to be able to survive the dark, but even then make sure you are far away from zombie activities as the horde might break in to your temporary stronghold. 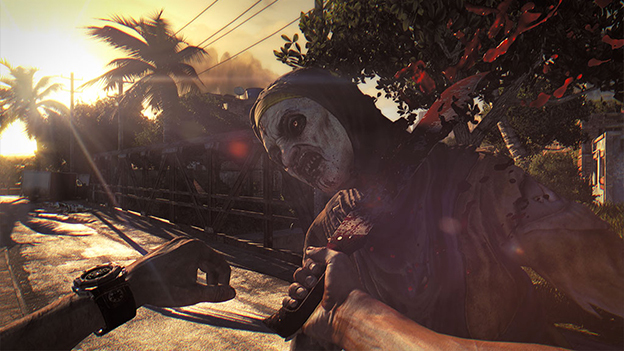 As you use weapons in Dying Light, you will upgrade your proficiencies with them. In fact, all character advancement is done via this proficiency system. Characters will get better at jumping, running, and combat as they go through the game. Run more, get faster. Jump more, get better at parkour. As you level up you will also get special abilities, such as a spin slash, a drop kick, a jumping stab, and more. 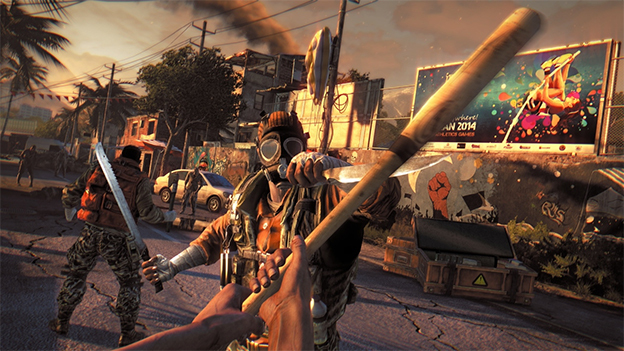 Dying Light also makes use of a positional combat system. Striking a zombie in a particular way will let you see that zombie’s skeleton, including what bones you have fractured. This can allow you to, say, one shot kill a zombie if you aim for their skull, or break a zombie’s legs if you want to leave it alive and use it as a trap. In fact, a big theme of Dying Light is using the infected against your enemies. You will frequently have to fight other humans in the game, and if you manage to remain stealthy, you might not even have to get your hands dirty. If you, say, make enough noise near an enemy encampment, the infected will just rush in and take them out for you. Of course, you can also use this as a distraction to sneak in yourself. It’s all about how you want to play the game. Dying Light is set to come out for the PC, PS3, PS4, Xbox 360 and Xbox One in February of 2015. It’s not the most unique zombie game out there, but I have certainly played worse open world action games in the past. At night, the world undergoes a deadly transformation: the hunter becomes the hunted as the infected grow more aggressive and numerous, and something far more sinister awakens to stalk its prey. Free Running Movement ? Whether tracking prey or escaping predators, Dying Light lets players swiftly navigate the world by seamlessly leaping between buildings, grappling up walls and pouncing on unsuspecting enemies. Why use a wrench when you can use a wrench wrapped in electrified barb wire Dying Light's sizeable crafting system enables players to create a slew of new, more potent weapons and equipment, as well as specialized ammunition.